Most managers say that employees are their most important asset. Their actions must be consistent with their words. Good managers take responsibility for the people who work for them. Their employees are paid a good wage, are treated with respect and have individual professional improvement plans. Allow ample time for your employees to write their personal goal statements. Employees should also be given wide latitude when developing their goals. Goals should not be limited to their current job, but should include their aspirations for the future. A goal may be as brief as "continue to be the best printer operator in the shop." Or the goal could encompass something larger, such as "complete my degree in law enforcement and become a state trooper." Remember, this is the employee's goal for themselves, not your goals for them. Take the time to learn why your employee has chosen that personal goal. Perhaps they're happy in their current job, and have no desire to move up in the organization. Or they may be using this job as a stepping stone to other departments in the company. They may want to have a career in the mailing industry, progress through the ranks, and eventually apply for your job. Talk to your employees to understand the motives underlying their goals. With your employee, map out the steps they must take to achieve their goals. Include the long-term and short-term results they must achieve to be successful. If they want to become a supervisor, list the classes they must complete to be considered for such a position. If they want to take external courses, include the performance measurements they must meet to be eligible for tuition reimbursement. The plan should include intermediate objectives that lead to their goal. For example, an employee can't move directly from clerk to manager. They must first become a senior operator, then a supervisor and then a manager. Each of these steps will require individual plans for professional improvement. Conduct progress reviews quarterly. Give praise for tasks completed successfully. Question why steps haven't been taken. Explain the long-term impact of their current performance to achieving their goal. Ask what you can do to help. If necessary, recommend other sources, like Human Resources, for assistance. Each year, have your employees challenge their goals. Circumstances change, and so will their goals. Ensure that the goals still reflect their desires. Whether the goal is modified or affirmed, map out the next steps to be completed. You should follow these same steps with your own career. Develop a goal statement and share it with your boss. Incorporate your objectives into your annual performance review. Take personal responsibility for your professional growth. Your employees are your most important asset. Take the time to nurture your staff and help them grow. 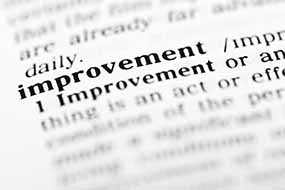 Individualized professional improvement plans are a great way to assist that growth.